Karate has helped my 3 kids (18, 13 and 11 years) in many ways. They are athletically fit, focused, they have learned about goal setting, and they know a little bit of Japanese too, after 5 years. If you enroll your kids at Tanaka’s Martial Arts Academy, you will see positive changes very quickly. It is a great sport and they will learn lifelong skills and you will be able to rest assured that they will be able to protect themselves. As a parent, I like the discipline, focus and sense of achievement they get when earning the next Belt Rank, and I love to watch the Katas. Sensei Tanaka is a master, and he brings countless years of experience; both from himself and from the many black belts associated with and teaching at his academy; not to mention that the classes are fun and my 3 kids love it! Karate is very good for your kids, especially if they have trouble with confidence or focus. Learning Karate has taught my 7-year-old daughter to be more confident as well as teaching her to use her manners and to be more outspoken. I recommend Tanaka’s Martial Arts Academy, because they are very friendly and patient with the kids. My son has been attending Tanaka’s Martial Arts Academy for 3 years now, and I will recommend it for every kid. Mr. Tanaka maintains the structure and balance in his class that I expect as a parent. He makes things fun for the kids, while still maintaining discipline; and he presents the same manners and behaviors that as parents, we also try to instill in our children. Sensei Tanaka is also always teaching different facts such as history or present-day events, math, etc. Karate is something that will help your children all their lives. It teaches them self discipline as well as mental and physical exercise. If you are willing to commit to an endeavor that will change your life for the better, an experience that can help you cope with troubles, past, present and future; then Karate will give you a feeling of well being, and a level of confidence your may have never experienced before. Sensei Tanaka has decades of experience instructing students in the martial arts, and his knowledge, enthusiasm, and philosophy are gifts he is willing to share with those who are willing to put forth a genuine effort. I have benefitted from Karate on a physical, emotional and spiritual level. I believe Karate has saved my life on several occasions, because self-defense is much more than facing attackers; it is being prepared, body and mind, for the danger life itself can throw at us. 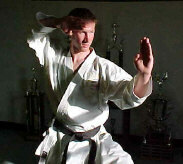 Karate is much more than another sport; it’s a way of living your life. Ever since I started Karate at Tanaka’s Martial Arts Academy, I feel so reenergized and excited about doing something that not only keeps me physically fit, but it also sharpens my mental abilities. After earning 2 Engineering degrees, and an MBA from HBS, working for Fortune 500 companies, having two kids, opening my own business and moving around the world; I never thought I would find something so challenging yet rewarding to do for myself; as for the first time in my life, I get to practice a level of connection between mind and body that only Karate has allowed me to experience. Sensei Tanaka is a master. He is wise and inspirational. He is kind, yet strict; after all, what is Karate without discipline? He is the best teacher, because he has 40+ years of teaching experience, but furthermore because he truly cares about his students. My grandson, Tyler, was really struggling in many areas of his life at age 12. ADHD made it difficult to focus his mind and get emotions under control. He was bullied at school and just did not fit in. I was determined to get him help and his mom wanted him to attend Tanaka's Matrial Arts Academy because of all the good things she had heard about Mr. Tanaka. What has happened in his life is almost unbelievable! Tyler is now 15. He started with private classes as he was much too uncomfortable to walk into a group class. Tyler had to be taught some of the simpliest things: how to walk, run, and how to stand up. Things did not come easily, but with Mr. Tanaka's patience, time and effort, Tyler has become more confident and is learning to use his brain. When Mr. Tanaka thought the time was right, Tyler joined the group classes. Tyler just finished his freshman year and his grades have improved greatly. He is a happy young man. Tyler says " I don't know where I would be if I hadn't come to Mr. Tanaka's"! Our entire family joins in Tyler's thankfulness. You are the best Mr. Tanaka. Thank you for caring!